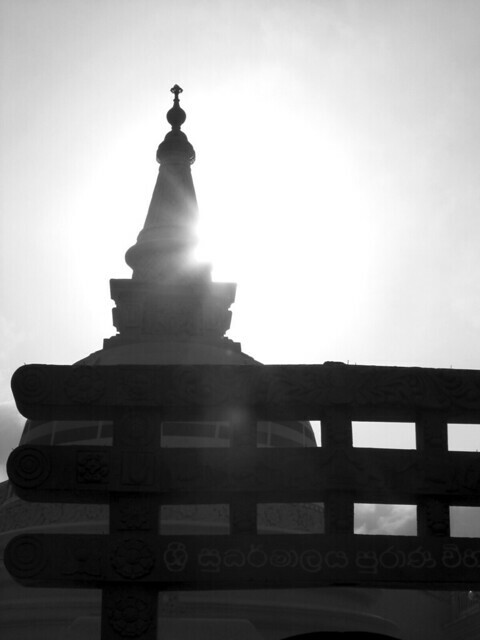 After much delays in getting my posts up, I thought, finally, I’m done with Sri Lankan travel series. Until I realised that I have not. What about the food? That’s something very important and shockingly, I haven’t mentioned anything about them up until now. Abnormal for a girl who eats a lot and likes to, as much, talk about food. When I travel, I like to eat what the locals mostly eat. 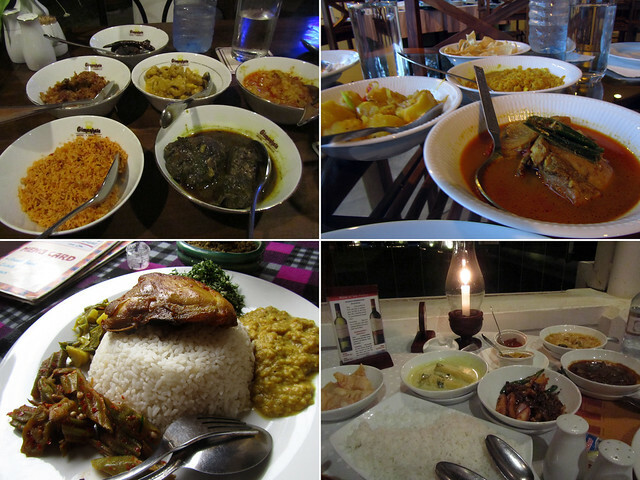 In Sri Lanka, that means many meals of rice and curry. Some were absolutely delicious, some a tad more pedestrian, and most times the portion size was just downright scary. At least I wasn’t overpaying for “foreign” meals. I’ve seen the price of a plate of spaghetti bolognese easily being equal or higher than a meal of rice and curry that could generously serve two. Rice and curry sounded so simple, but often it had more elements and ingredients than a typical Western home cook would encounter in a week! Rice was, well, rice. Often times they were plain boiled/steamed rice. But the curry! It wasn’t a single curry dish that I would cook at home by throwing 3-4 types of vegetables and/or meat in with some curry paste and coconut milk. We’re talking of typically 3-6 different curry-base dishes to go with the rice. Not unlike the concept of thali in India, or nasi lemak in Malaysia. And oh how good they often were too. Even our drive to Colombo was not without its own drama. 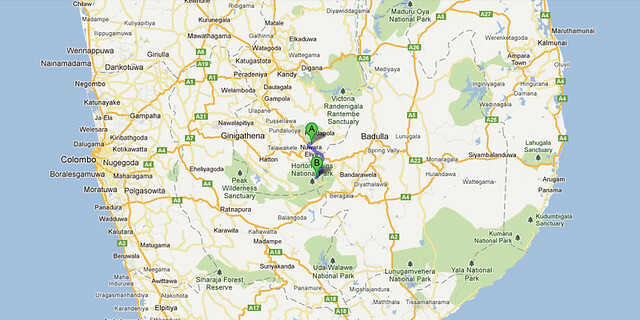 A few days earlier, we had encountered some problem with the air-conditioning system as we were arriving in Ella. 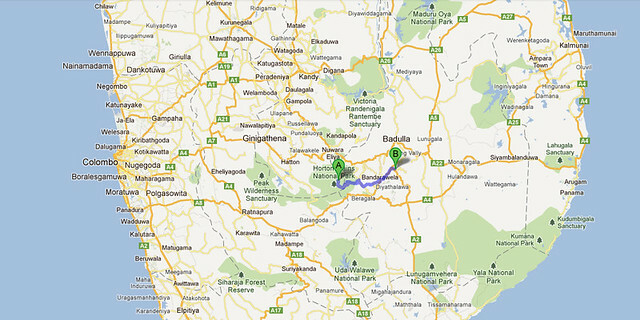 It was supposed to be fixed but not even half way through the drive (right after Balapitiya), the system failed again. This time, we didn’t have the benefit of the cooler temperature of higher altitude and the heat in the van as we approached late morning/midday was becoming more and more unbearable. 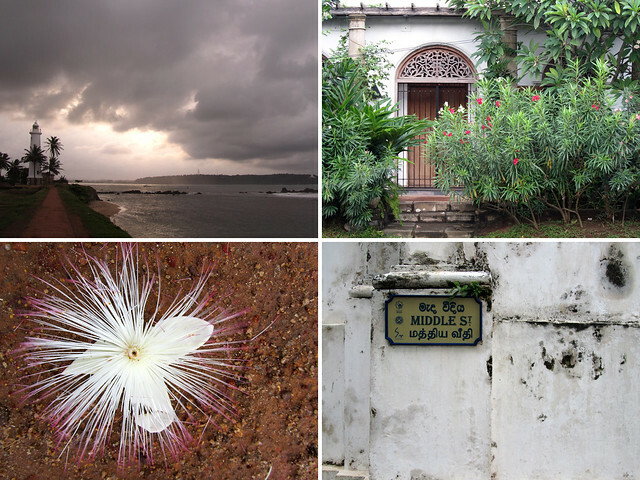 Galle was the penultimate destination of our journey, and after a week of moving from city to city, we were looking forward to getting to Colombo where we would stay for a good few days. There’s nothing like a new bed every night (and not knowing where you’d sleep the next day) to make us appreciate the comfort that would await us in Colombo – our luxury hotel in Colombo was the only that we’ve booked well in advance and which we agreed to splurge on. More on that in the next post. Prior to arrival, we have booked to stay in the New Old Dutch House within the fort city through the phone, of which I had a verbal price confirmation, that it was inclusive of taxes etc and ensured that accommodation and food would also be provided to our driver. On checking in, we found ourselves enchanted by the distinct colonial feel to it but soon felt we’ve been had – Nilan was being accommodated elsewhere at an additional charge to us (we were later told the room provided was with poor facilities and even trickier to find a place to park the van we were travelling in) and without food, and they even tried to add taxes to the price of our room. Travelling across the southern coastline of Sri Lanka took us from Tissa to Galle (pronounced as Gaul), our next main destination. 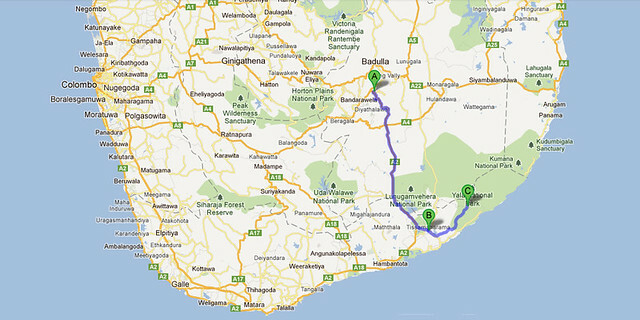 We took our time though, completing this journey of about 150 kilometres over 4-5 hours time. We had short stops along the way so we can indulged in spots of photography, plus we also visited a blowhole and a 2004 tsunami memorial site. The initial part of the road to Galle saw us exiting Tissa but passing by vast open fields and notable turn offs to get to Bundala National Park. 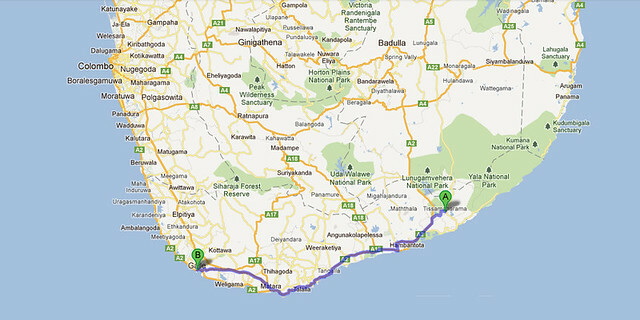 Not long thereafter, we began to sight the coastline and stayed driving pretty much along this scenic route. And like everywhere else in the country, we soon also spotted a number of Buddhas along the route, but more notably, we began to notice Buddha in standing position and in different poses. Up until now, those which we have noted tend to be of sitting or sleeping positions. After our good and scenic rest at Ella, we took off further south to Tissamaharama – Tissa in short – our base for exploring Yala National Park. A former capital of Sinhalese Kingdom of Ruhuna, today it is a town running close along the man-made lake Tissa Wewa (which dated back to the time when the kingdom was present), with businesses lining the main street and otherwise surrounded by (burnt) paddy fields. We have opted for a late afternoon/early evening safari at Yala National Park but considering we arrived at Tissa quite early, Claire and I decided to explore the main street by foot after we checked in to a hotel at the edge of the town. As we walked, we were reminded that we were no longer in the hill countries. We definitely felt the heat of the late morning sun. Ella was meant to be our short reprieve from the packed roadtrip schedule, well placed half way through the week. Given the number of posts written for this trip so far, it may seems like it has been a lot longer but we’re actually only four days in! It ended up being a break needed by our driver too. Now, now, no jumping to (wrong) conclusion that we’ve put him behind wheels excessively; rather something has gone wrong with the air-conditioning system. For most part of our ascend by van to Horton Plains from Nuwara Eliya, we were shrouded in blankets of fog and visibility pretty much stayed within the range of a few meters ahead of us. Light drizzle also accompanied us on this early morning as Nilan drove up small and windy road of… well, I don’t really know, since I could hardly see much. Instinctively, I believe, if we ever slipped up, we would be rolling down the side of a pretty high hill. However the task was not at all daunting for Nilan. 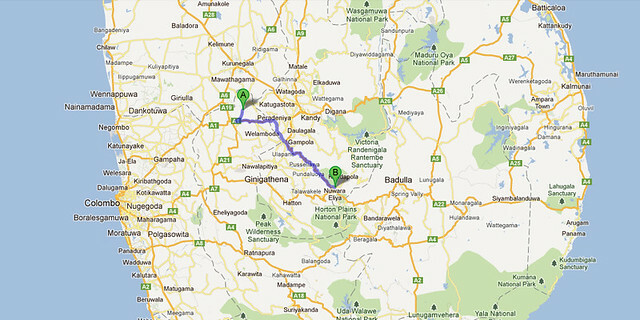 The distance we were to cover was just over 30km but it’d take approximately 2 hours. He was busy as ever chatting on his mobile phone (hands free, in an unconventional manner – don’t ask) while Claire and I silently wished he would not be too distracted when he shouldn’t be. Honestly, we had no idea who he’d be talking to at six in the morning. If anyone ring me at that time, unless it’s an emergency, I’d hang up right away. Secretly though, Claire and I were impressed at the strength of mobile phone reception in this country. Even high up at a remote national park was no barrier to mobile telecommunication here! Names of places in Sri Lanka had been straight forward so far into our roadtrip, until we told Nilan that we wanted to go to Nuwara Eliya after Kandy/Pinnawala. He looked at us and reconfirmed “Nur’Eliya?” to which we puzzly replied, “no, we want to go to Nuwara Eliya.” Oh the confusion – because apparently one doesn’t pronounced this particular name syllable per syllable as written. Nur’Eliya it was! 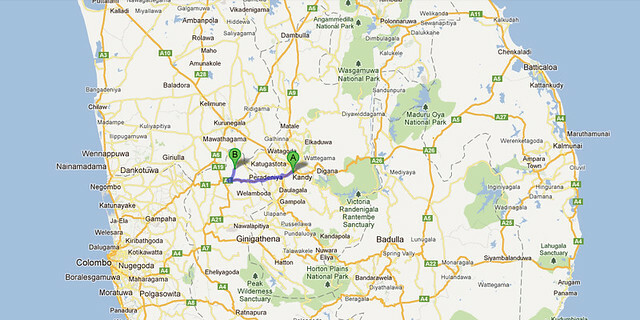 To get on with our itinerary, we needed to first drive back towards Kandy, passing the Colombo-Kandy road once again. It was a rather picturesque stretch of road, with views of rolling hills on one side of the road. However, as we were in a hurry in the morning to be at the sanctuary by opening time, we didn’t really appreciate what we saw as we should. This time, we took the opportunity to actually slow down and enjoy the views. As Claire and I have been busy from the word go, jetlag never really got a chance to hit us. Day three and we were up for another early morning adventure. 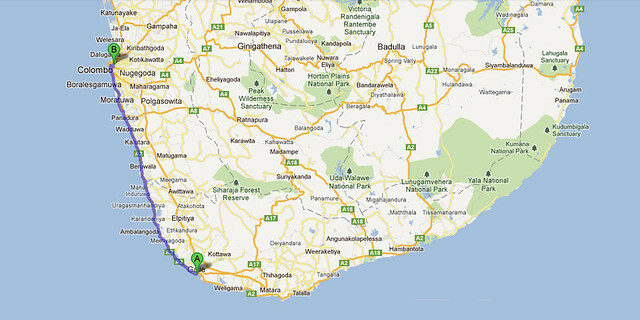 Destination: Pinnawala Elephant Sanctuary. Situated some 20-odd kilometres away from Kandy on the Colombo-Kandy Road, we made it there in time for the door to open for the day at 8.30am so we could participate in the morning (9.15am) feeding and to also not lose further time from our schedule. At this stage, we had a pretty good idea how the remainder of the week would roll but subject to plenty of flexibility. Even though it was early, a small crowd was already waiting by the gate when we arrived. And perhaps precisely for the early hour, we didn’t see too many foreign tourists there either, the most obvious being a group of French tourists who were bantering among themselves (yes, I occasionally eavesdropped shamelessly but some of the things they said were too funny for me to disregard). Nilan made life easier for us by purchasing tickets on our behalf (we gave him the money and stood aside to wait) and with our (foreigner price) entry plus supplementary feeding (Rs 2,000 + Rs 250) tickets we made our way in.